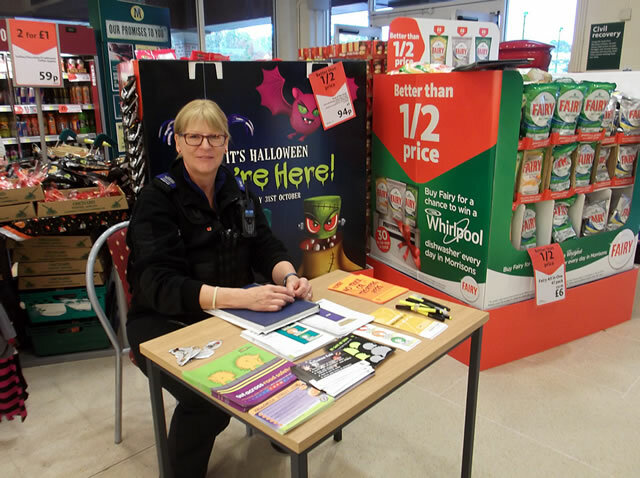 As of the first of August Jan Sparkes became the PCSO responsible for Wincanton. Jan is a bright, cheery person and says that she is eager to get to know the people of Wincanton, and for the people to get to know her. Policing in any community is a two way street. The Police depend on the assistance of the community just as much as we depend on them to keep the peace and protect us. At a time when the financial climate forces all organisations to achieve much more with so much less the name of the game is to "work smart" and get best value for your money. One such initiative is to take advantage of the footfall at Morison's Wincanton store. Clearly this store has the biggest throughput of people in Wincanton, making it the best place to make contact with people in Wincanton. To that end the police have set up a "Weekly Beat Surgery". That means that Jan will be there every Wednesday or Thursday (depending on her shifts). She has her table near the entrance to the store. She will be able to supply any information that the Police need to get to the community. It's also the place where you can chat with her, get to know her and register your concerns, and you can talk with her in confidence. Our PCSO's play an important role in local policing, reaching out to schools, sheltered housing, the High Street, pubs, clubs, residential and business estates. PCSOs deal with criminal damage, and anti-social behaviour. Where possible they endeavour to spend circa 95% of their time in high visibility foot patrols around the town. They have authority to detain you for up to 30 minutes if they have reasonable grounds. When detained, if you walk away inside that time period you are deemed to be breaking the law and subject to arrest. PCSO's have the authority to conduct a search for alcohol and tobacco if they have reasonable grounds to suspect that the person is under age and concealing them. Although PCSOs have the authority to detain a suspect they don't have the authority to arrest anyone. They call for a police officer to attend where an arrest can be made. Although County and District Councils are responsible for on-street parking, and car parks, PCSO's can impose a fixed penalty notice if you park on double yellow lines, causing a blockage/obstruction. PCSOs can also issue a fix penalty notice for anyone who parks on zigzag lines, which are found close to crossings and at the entrances to our local schools. Jan stressed that she is eager to hear from members of our community. If you wish to report an issue or incident this can be done confidentially. All you need to do is ring – 101, or 999 for emergencies, or call Crime Stoppers 0800 555 111. Asked about the use of CCTV Jan said that this can provide important evidence in the solving of crime in the community. The next time you pop into Morison's visit Jan at her desk and ask her to explain how they verify the time accuracy of CCTV footage. It's simple but interesting. 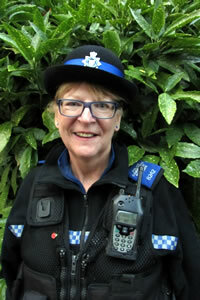 Jan is clearly a very dedicated PCSO and on a mission to make a difference in our community. She is part of a team of PCSO's who cover all the towns and villages between this area and Yeovil. They are doing their very best with the limited resources at their disposal. So please help Jan and her colleagues to help keep this a great community. The current issues for our community include a spate of car battery thefts, especially from Citroen Saxo's and Peugeot 106's. For all local developers and building sites please ensure that your power tools are secured safely overnight, otherwise the risk is that they go walk about. On the run up to Christmas our local police will be keeping a tight control over alcohol and anti-social behaviour. Great Idea, Love the chance to actually have a police officer that takes proper interest in the town. I agree. But while it's nice to be supportive of the High Street the undeniable fact is that Morrisons gets more footfall and so it's the better place to meet members of the community. Yes, we want to change that, but this particular enterprise isn't responsible for that so for now they're clearly better off using Morrisons as a base.